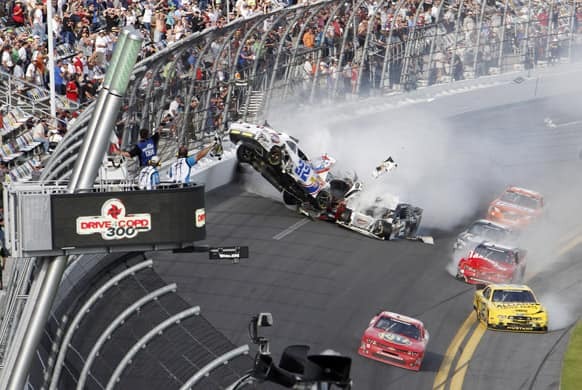 Kyle Larson`s car (32) gets airborne during a multi-car wreck on the final lap of the NASCAR Nationwide Series auto race, at Daytona International Speedway in Daytona Beach, Fla. 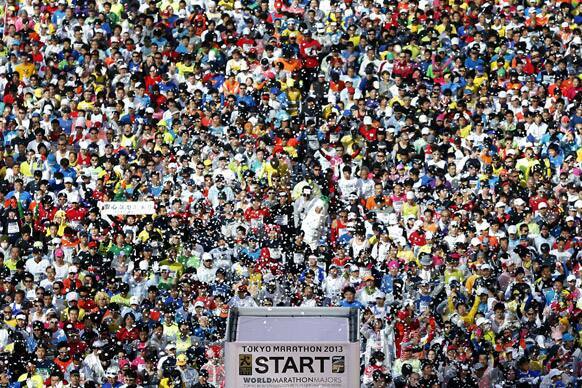 Emergency officials put out a fire from driver Kyle Larson`s engine after his car hit the wall and safety fence along the front grandstands on the final lap of a NASCAR Nationwide Series auto race at Daytona International Speedway in Daytona Beach, Fla.
Thousands of runners take their positions under a shower of confetti in front of the Tokyo Metropolitan Government Building at the start of the Tokyo Marathon. Marina Erakovic, of New Zealand, waves to the crowd after winning the final round tennis match against Sabine Lisicki, of Germany, at the US National Indoor Championships, in Memphis, Tenn.
Demonstrators shout slogans against the government during a protest in Madrid, Spain. 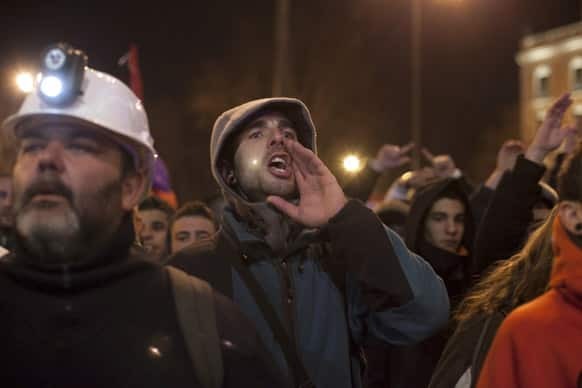 Thousands of people are marching on Spain`s parliament to protest austerity measures imposed by the government. Host Jimmy Fallon dressed as a mom, left, dancing with first lady Michelle Obama during an appearance of "Late Night with Jimmy Fallon," Friday, Feb. 22, 2013 in New York. 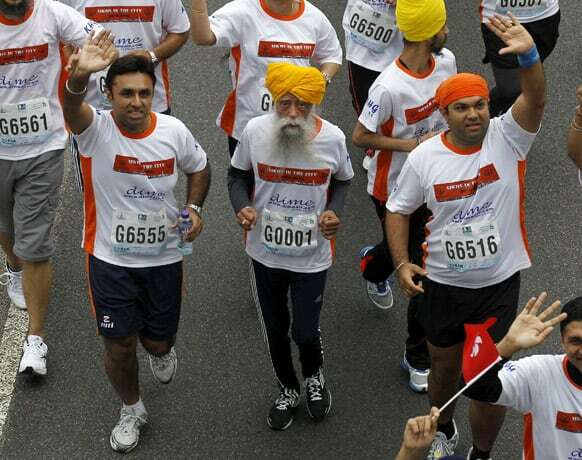 Centenarian marathon runner Fauja Singh, 101, center, originally from Beas Pind, in Jalandhar, India but who now lives in London, runs in a 10-kilometer race, part of the annual Hong Kong Marathon. 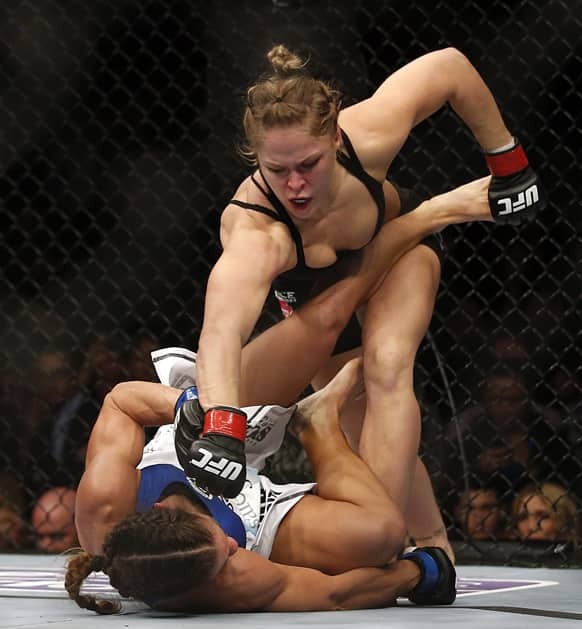 Ronda Rousey, top, punches Liz Carmouche during their UFC 157 women`s bantamweight championship mixed martial arts match in Anaheim, Calif.
A Filipino activist displays flowers and slogans bearing an image of late Philippine strongman Ferdinand Marcos on the eve of the 27th anniversary of "People Power" outside the pre-democracy shrine Bantayog ng mga Bayani in Quezon city, north of Manila, Philippines. 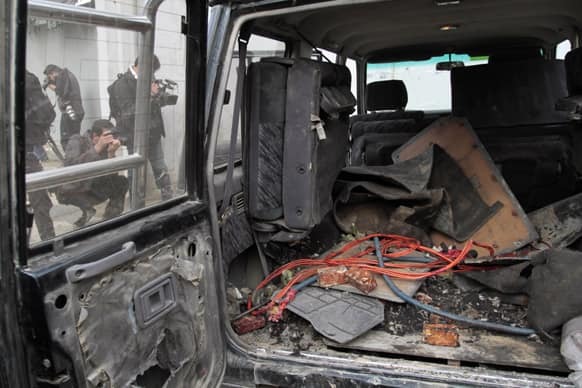 Explosive materials are seen in the back of a vehicle used by an insurgent at the site where he was shot to death in Kabul, Afghanistan. 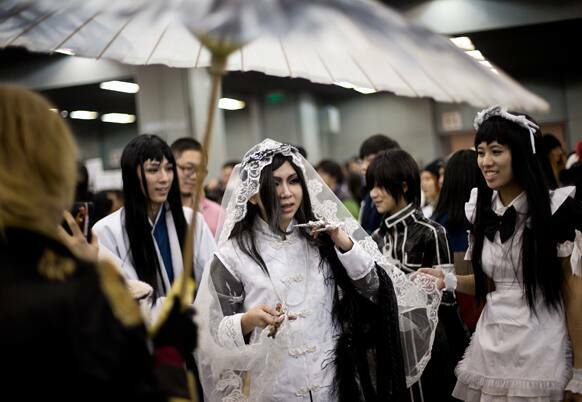 Chinese male cosplay enthusiasts dressed as female cartoon characters take part in the Animation and Comics Fair in Beijing. Kachin traditional artists troupe in traditional dress performs during a fund raising concert for refugees in Kachin state, at Myanmar Baptist Church Union in Yangon. 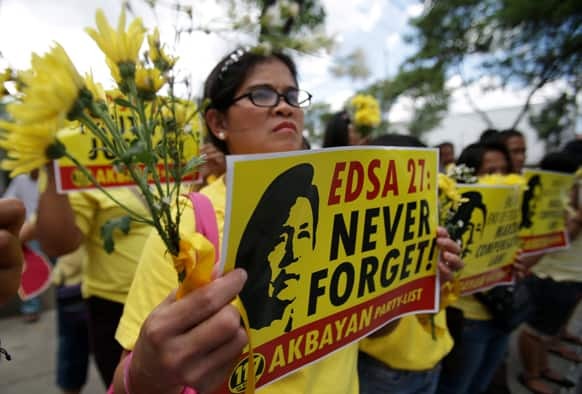 South Korean President Lee Myung-bak, right, greets Thai Prime Minister Yingluck Shinawatra, during her visit to Seoul to attend the inauguration of Lee`s successor, Park Geun-Hye, on Monday. 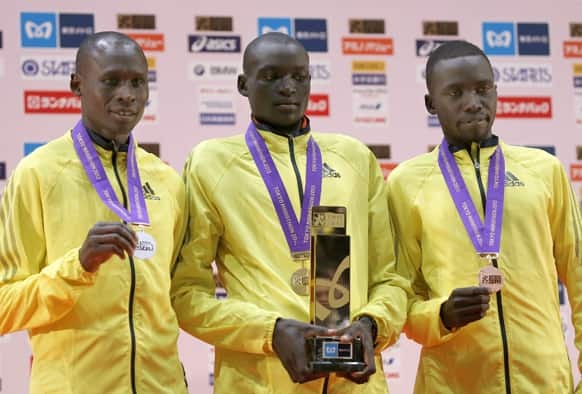 Winner Dennis Kimetto of Kenya, poses with compatriots Michael Kipyego, who placed second and Bernard Kipyego who placed third, after the awards ceremony of the men`s Tokyo Marathon in Tokyo. 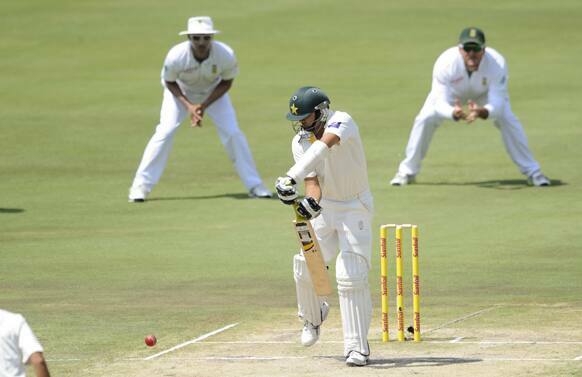 Pakistan`s Azhar Ali, plays a defensive shot against South Africa, during the third day of the 3rd cricket test match, in Pretoria, South Africa. 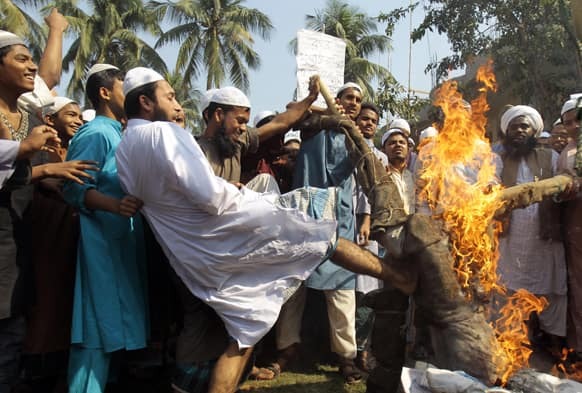 Activists of Islamic political parties denouncing war crimes trials linked to the country`s 1971 independence war, burn and kick an effigy of anti-Islamic bloggers inside an Islamic school during a nationwide strike in Dhaka, Bangladesh. 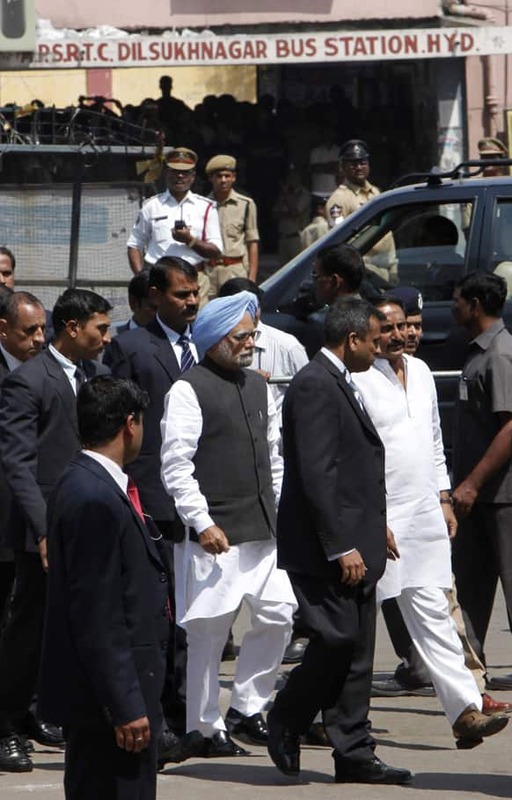 Prime Minister Manmohan Singh, blue turban, accompanied by Andhra Pradesh state Chief Minister N. Kiran Kumar Reddy, right in white, visits Dishuknagar bus station, one of the two sites of Thursday’s bomb attacks in Hyderabad. 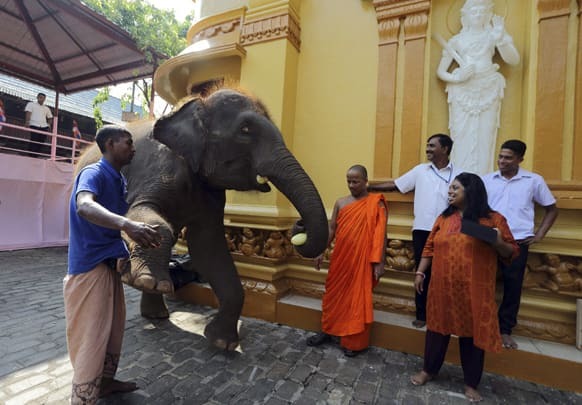 A Sri Lankan Buddhist monk, center, offers a cucumber to a domesticated elephant brought for a Buddhist temple festival in Colombo. 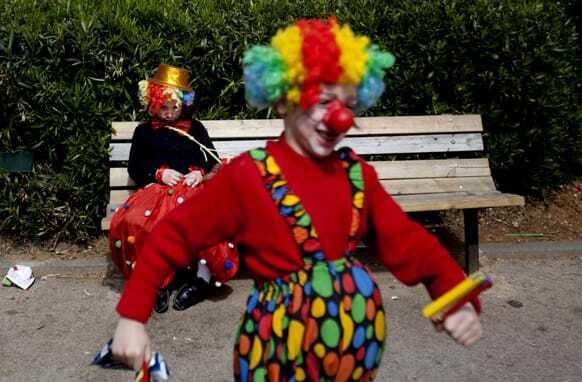 Two Ultra Orthodox Jewish boys dress as clowns during the Purim festival in the ultra-Orthodox town of Bnei Brak, Israel. 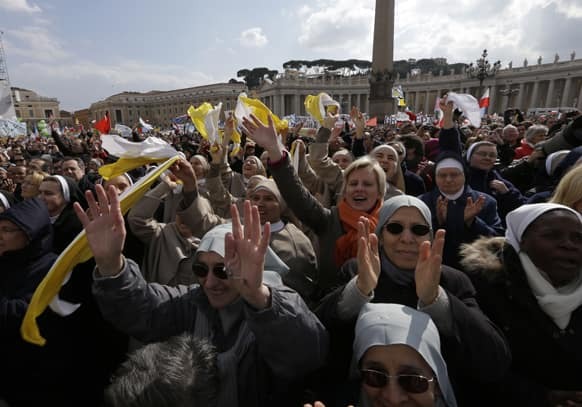 Faithful attend Pope Benedict XVI`s last Angelus prayer, in St. Peter`s Square, at the Vatican. 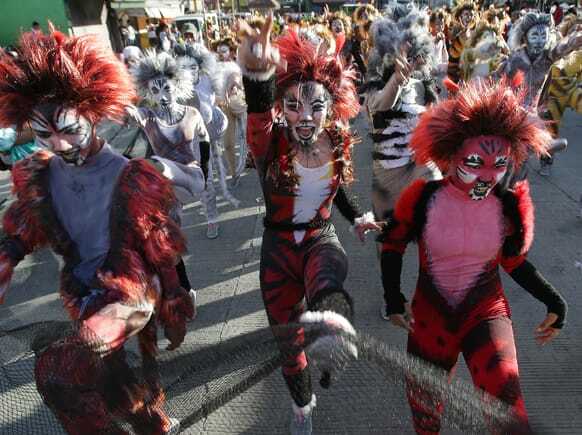 Filipino students dressed in cat costumes perform as they walk along a streets during the annual "Caracol" festival in suburban Makati, south of Manila, Philippines. 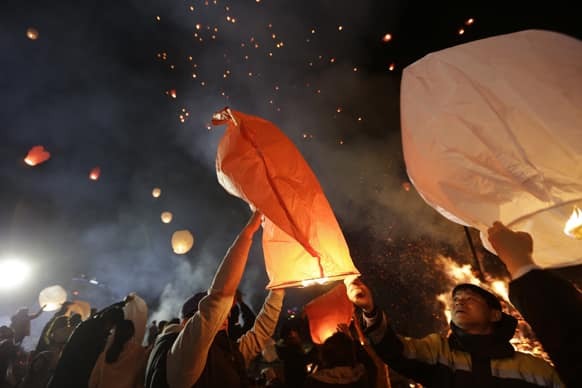 South Koreans release paper lanterns to celebrate the first full moon of the Lunar New Year, in Yongin, South Korea. A group of french dancing ladies are seen ahead of the English Premier League soccer match between Newcastle United and Southampton at St James` Park, Newcastle, England. 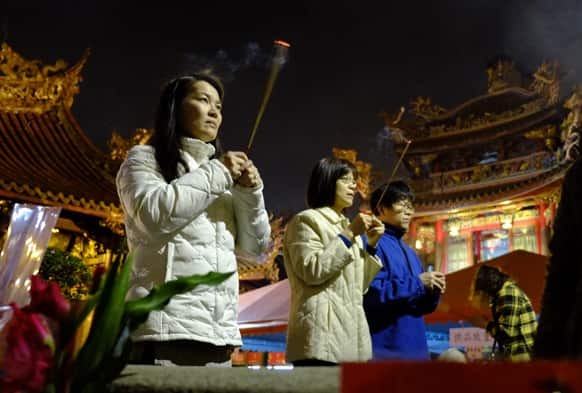 Devotees pray at the Lungshan Temple on the eve of the Chinese lunar new year in Taipei, Taiwan. 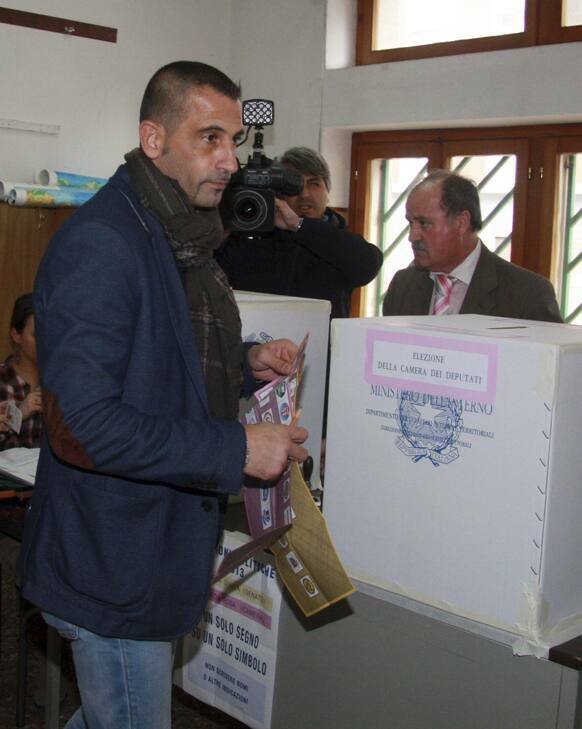 Italian marine Massimiliano Latorre votes in a polling station, in Taranto, Italy. 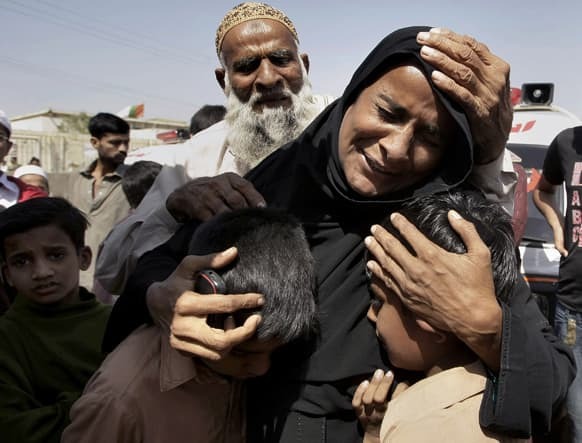 A Pakistani woman, Shahida Parveen, seen comforting her sons, mourns for her husband, Mohammad Akmal, a victim of a Sept. 11, 2012 factory fire incident, during a funeral in Karachi, Pakistan.